We are back in business. I'm starting with a late construction update for Tuesday and will try to follow up with another update later today. 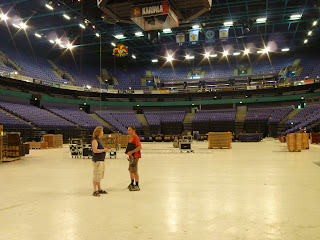 Some preparations are made on Monday, but Tuesday is the first full day of construction at the arena. 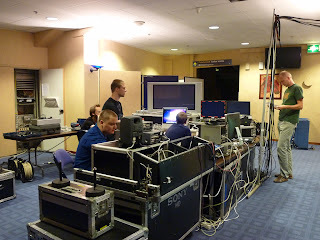 Work starts early and things get really busy by the afternoon truckloads of gear arriving almost constantly. I only arrived closer to 10 am, so a lot of gear was already inside. This was my first impression of the main hall. 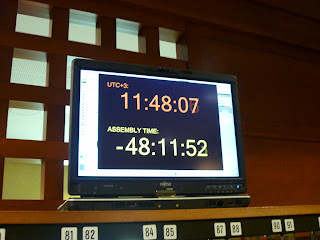 Most of the early work was related to the audio and video setup in the main hall and moving furniture in the TV production areas. 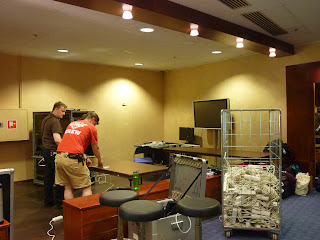 Proper TV work started once the first load of video gear arrived. 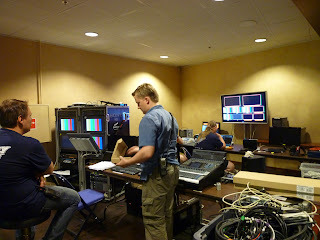 The first job was to place the two HD equipement racks for the studio control room. 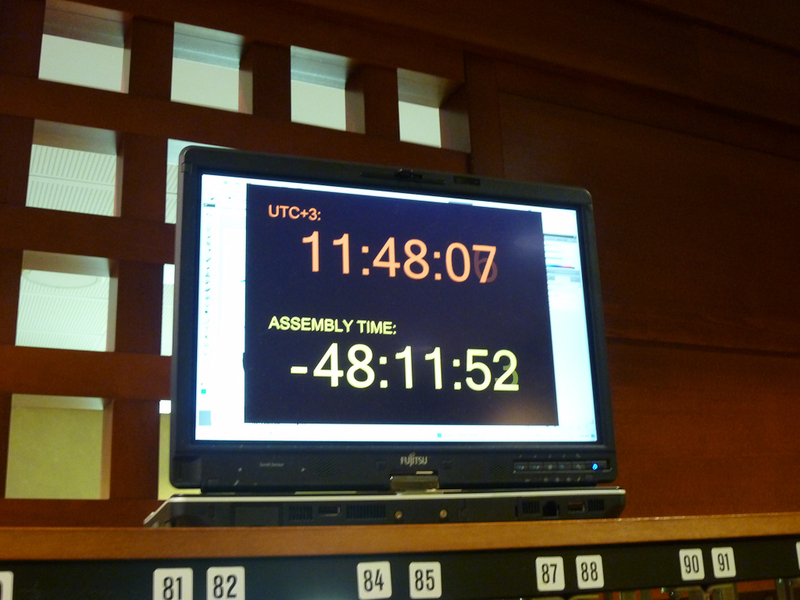 Naturally the first mission time display was also started. At the end of the day most of the heavy equipment is in place in the broadcast and studio control rooms. Cabling has only just started. There is also a synchronization problem to be solved between some of the video converters and we need to hack together some additional features for the intercom boxes we use. I dare say everything is under control for the time being. 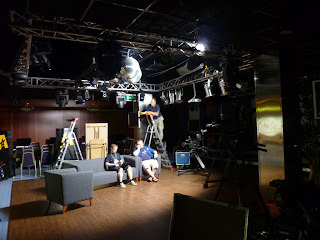 The studio is also starting to take shape with the first lights up and running. Obviously there is still a lot left to do here. 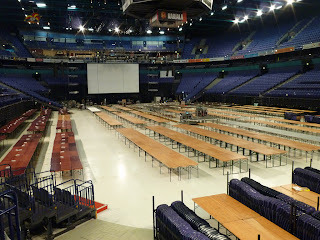 In the main hall almost all of the tables are in place. Chairs will only be added at the last moment because they might get in the way of other work. The main lighting setup is working, but the digital audio system we are using needs some firmware updates. The video projectors are attached and will be set up on Wednesday. Unfortunately I didn't take any photos of the hall AV control, but that should certainly be further along than the TV control rooms. Hopefully I'll find my way up there before tomorrow's update.